Am I wearing you out, my faithful reader, with my continuing onslaught of major life changes? I hope you've left room for desert, because I've got one more thing to tell you about: approximately mid-way through last year, I successfully pitched the idea for a short story collection of my new work from my time at DePaul to CCLaP creative director and founder Jason Pettus. 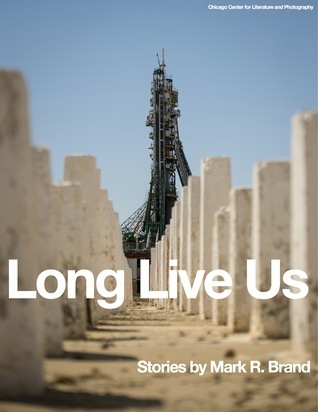 The collection, titled Long Live Us, will be released in mid-September. One of the commitments I made to myself when I began at DePaul was to try and work with humor more in my stories. They're all heavily satirical, these shorts, and I found that the lighter-hearted I was willing to go with the stories, and the more risks I was willing to take with working humor into them, the more biting the satire became. It wasn't all easy, of course; writing humor is exceptionally difficult and the line you walk between cheesy/flat and spot-on is exceedingly fine, but I had some terrific help with this from my DePaul mentors Dan Stolar, Rebecca Johns-Trissler, Hannah Pittard, Amina Gautier, and Miles Harvey, as well as my friends and colleagues at the DePaul Writers Guild that were very supportive of the stories, and of me, along the way. When I pitched the book to Jason, it included a number of shorts that were cut in favor of more serious pieces, and the end result is a book that feels, to me, like a nice blend of funny and serious, and benefits from the blend as opposed to the hard gear-change that a more wholly-lighthearted book would be from my current body of work. It's a departure of sorts, though, and not even editing and deliberate inclusion of far-future sci-fi stories can hide that. There's a lot of where I am now as a writer in this book, even though it includes two stories that have already been published in other books, and were written in the summer before I started at DePaul. I took a lot of what felt like chances at the time with these stories, working with different narrative strategies and voices, and abandoning the futuristic settings and comfortable topics at times, but eventually these experiments enhanced, rather than diffused, my ideas, and I ran with them. We eventually trimmed the book down to eight short stories, most of which revolved around people dealing with difficult economic times, people fighting through adversity out of simple fear, or for reasons they're not sure they believe in anymore, or people promised something that they're just now figuring out isn't coming. It's a collection about the Great Recession, essentially, and why such a phenomenon at once frees and murders, ennobles, and annihilates us. Here's the cover image on the Goodreads page, a special sneak-peek for those of you who bothered to read this. Look for it in mid-September at cclapcenter.com. If you'd care to get a further peek into a couple of the stories included, you can always check out the collections American Wasteland (CCLaP, 2011) and Daddy Cool (Artistically Declined, 2013), each of which feature one of the stories from Long Live Us.